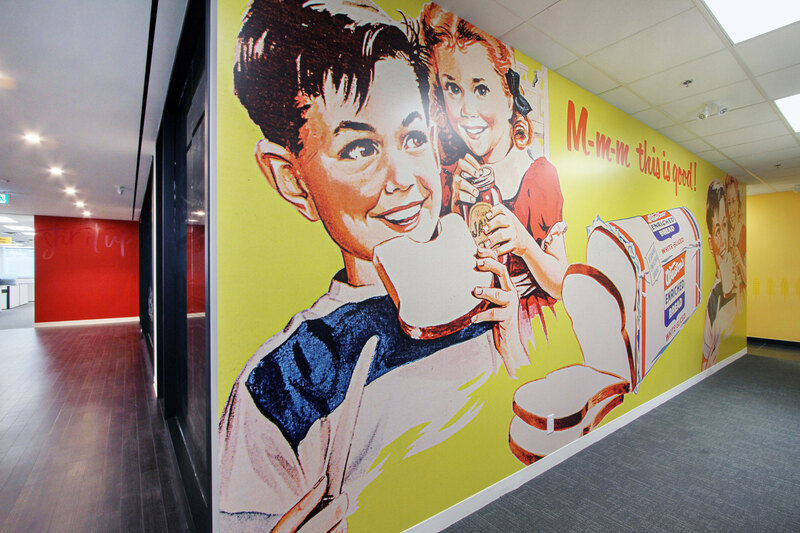 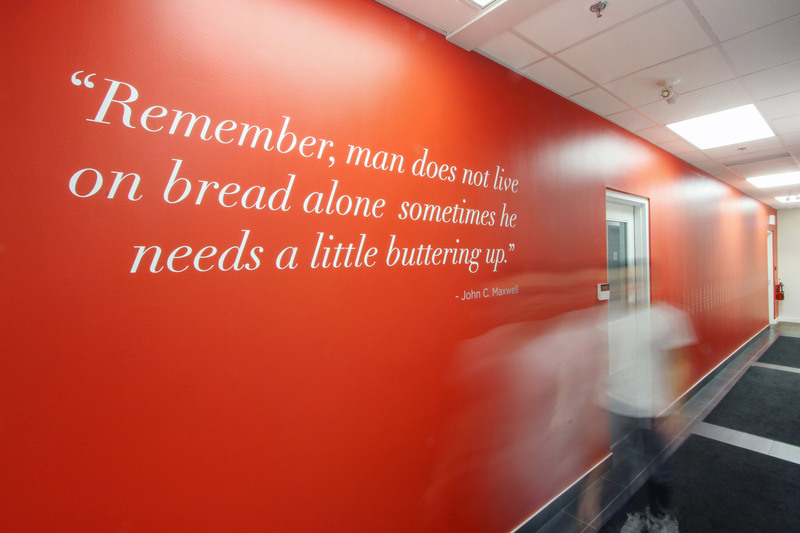 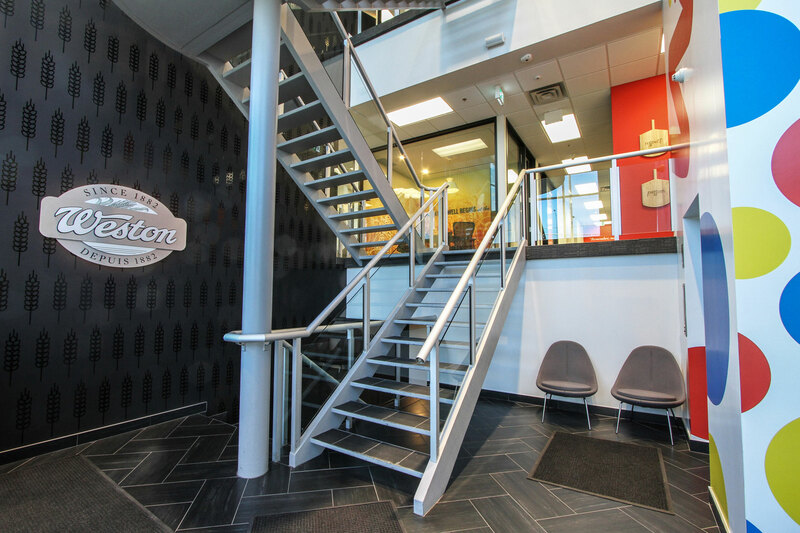 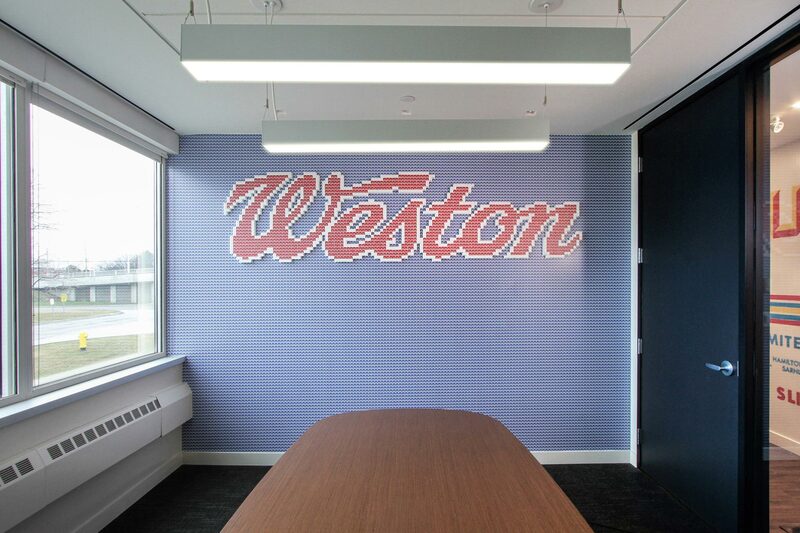 Weston Bakeries came to us with a quest to give their out-of-date office space a much-needed facelift. 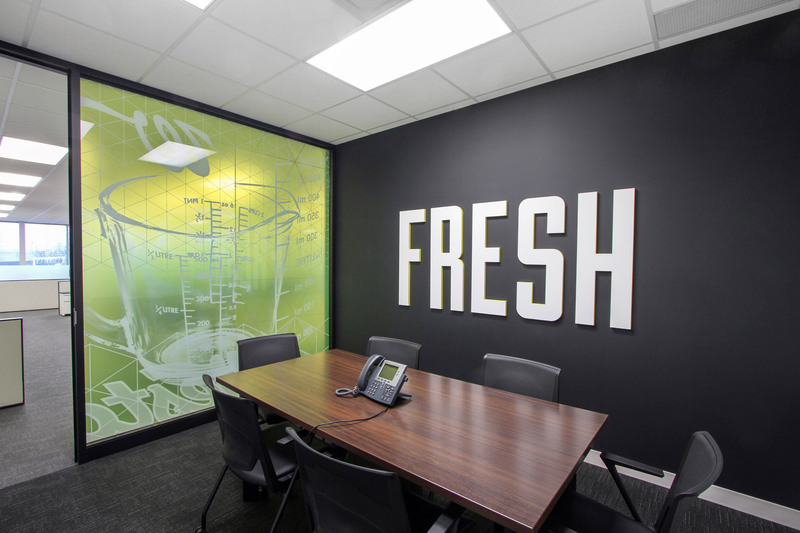 With the concept of “fresh forward,” we began to unearth 100 years a of history, images, and archived relics that served as the core of the design. 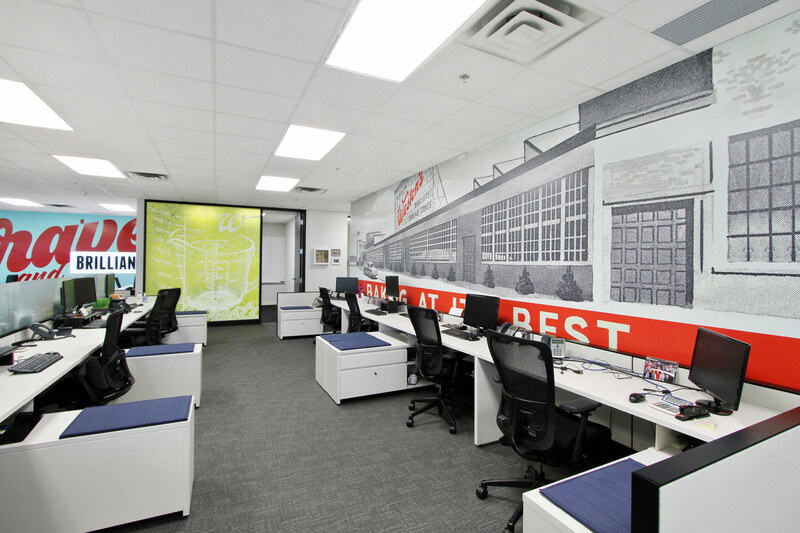 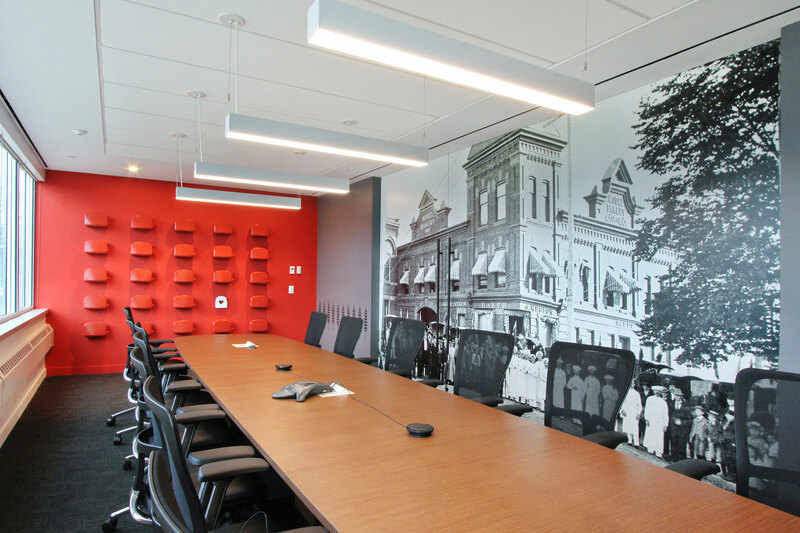 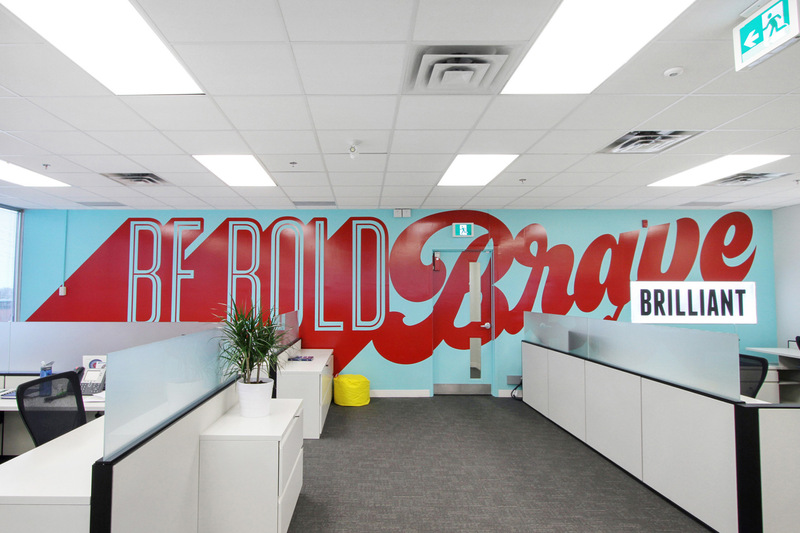 The challenge was to create an engaging space that energized those within it. 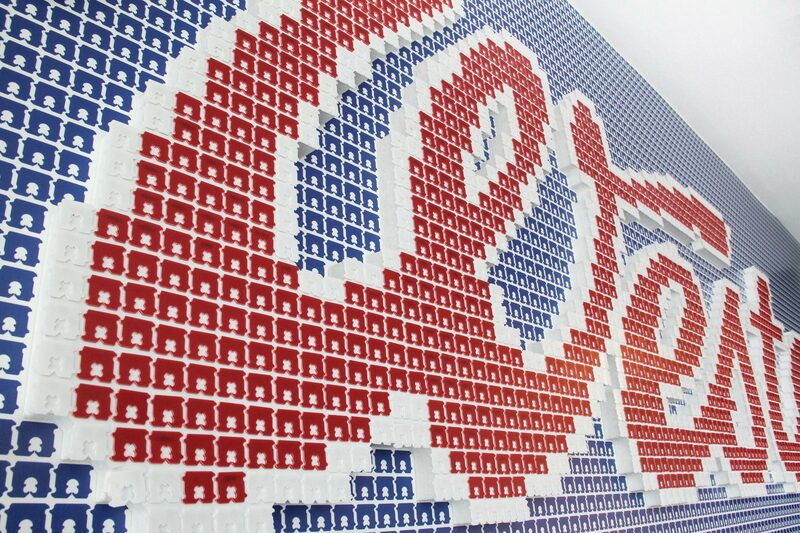 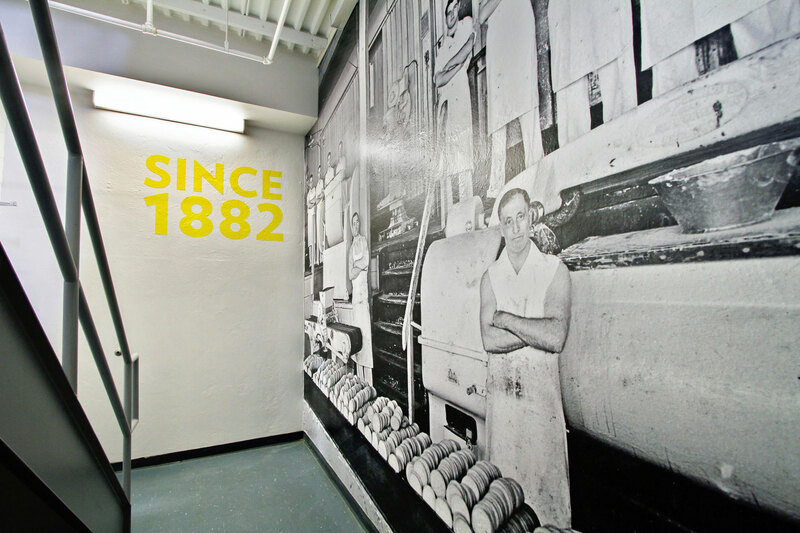 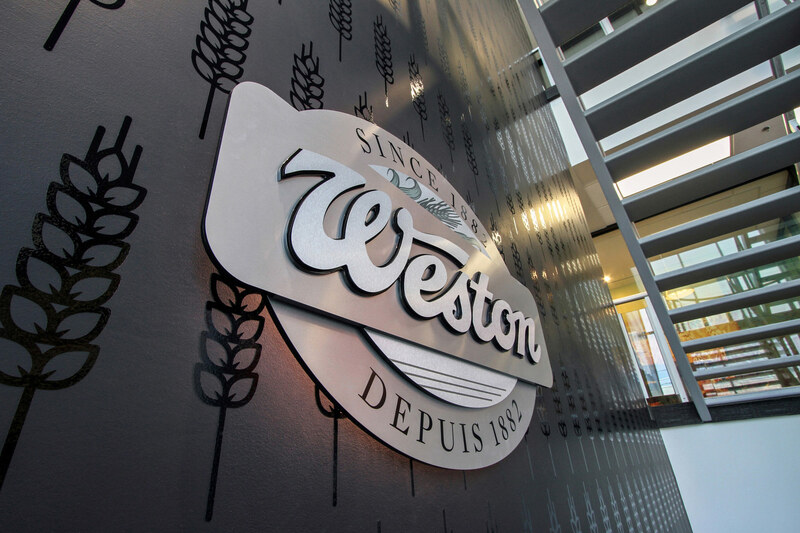 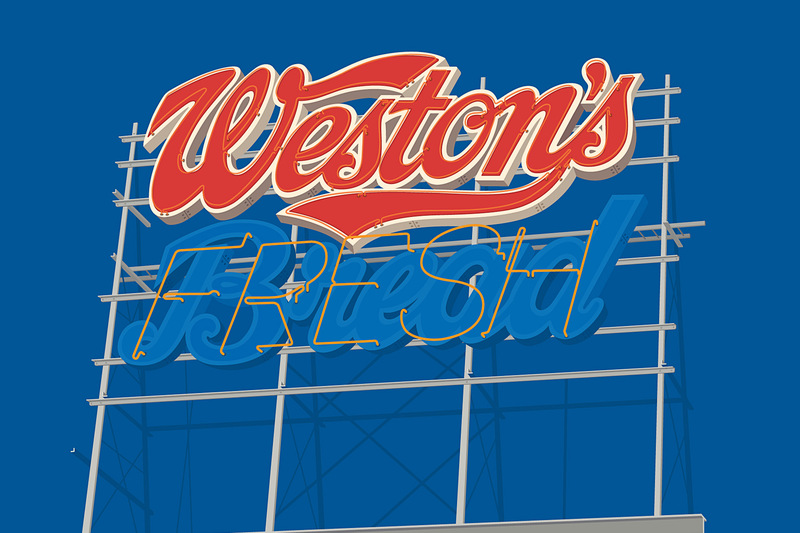 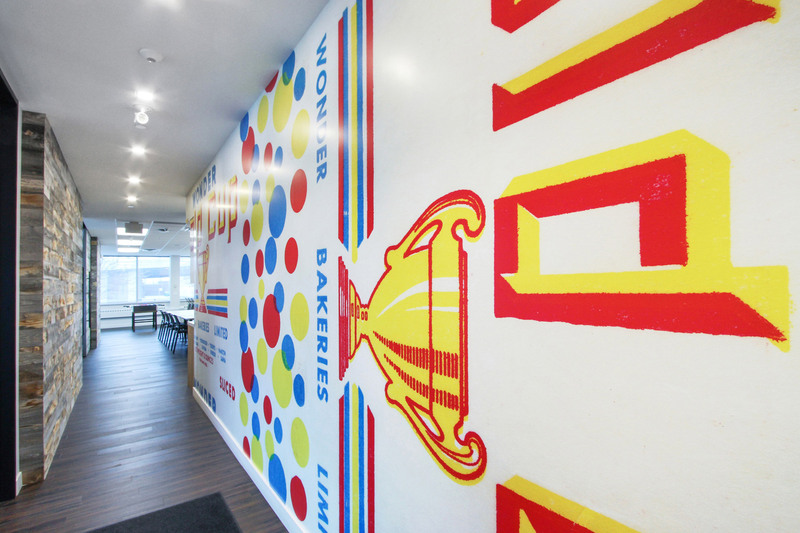 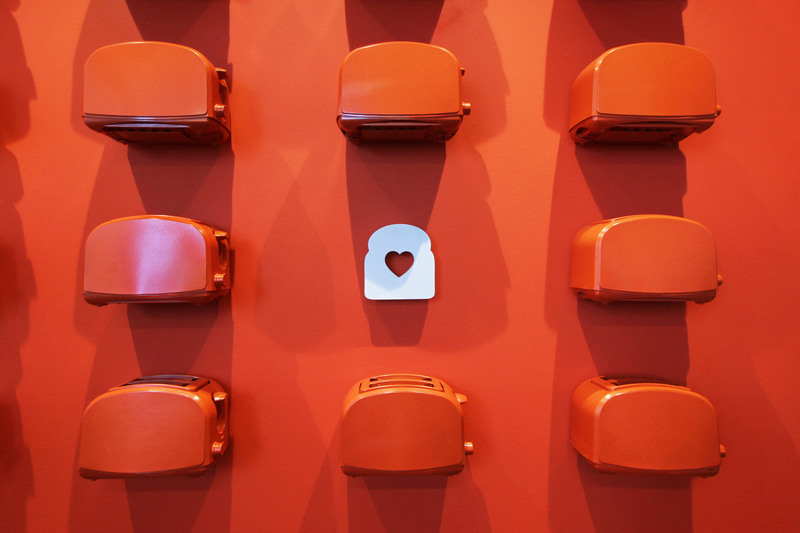 We set out to highlight the core brands, bread culture, and evolution of Weston Bakeries through use of image, colour, texture and objects—all of which provided a creative space that welcomed, inspired, and informed the head and heart of Weston bakeries employees and guests for years to come. 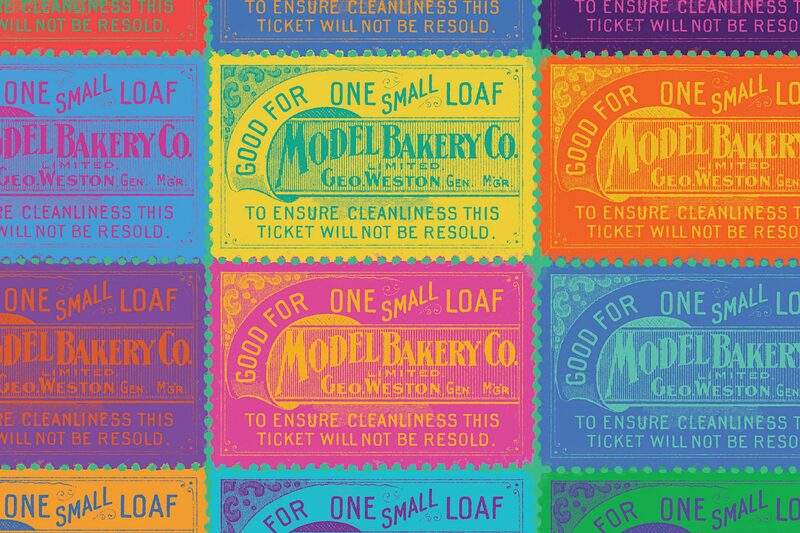 With over a century of history, we had a wealth of visuals and artefacts to pull inspiration from (including the original handwritten bread recipe from founder GW Weston, original Weston bread tickets, and vintage product ads from many decades). 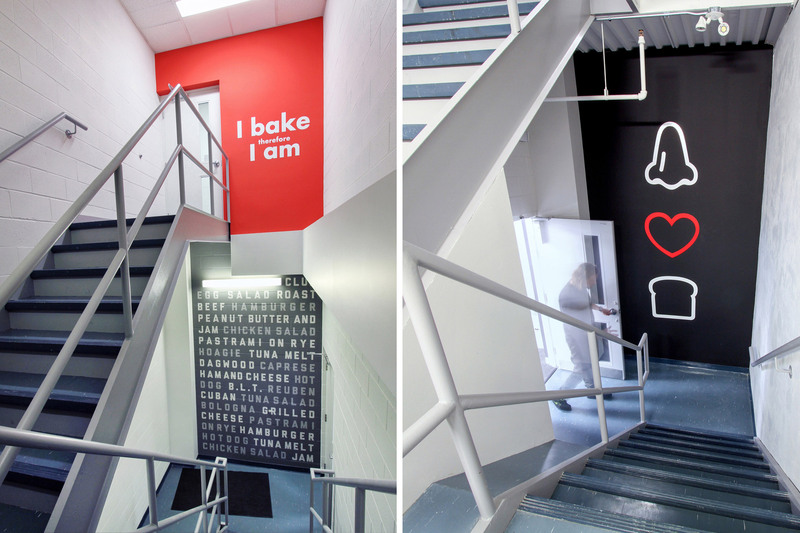 We showcased the key brands and products using images, sayings, equipment, ingredients, textures, and tools as inspiration. 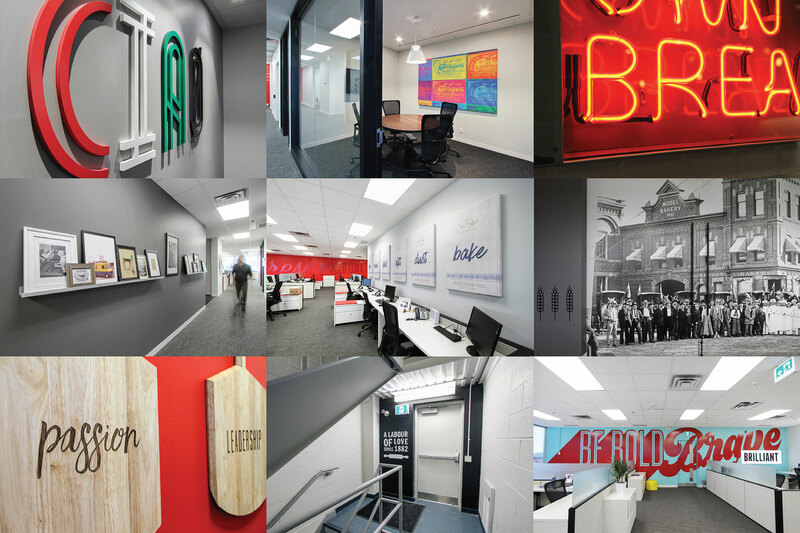 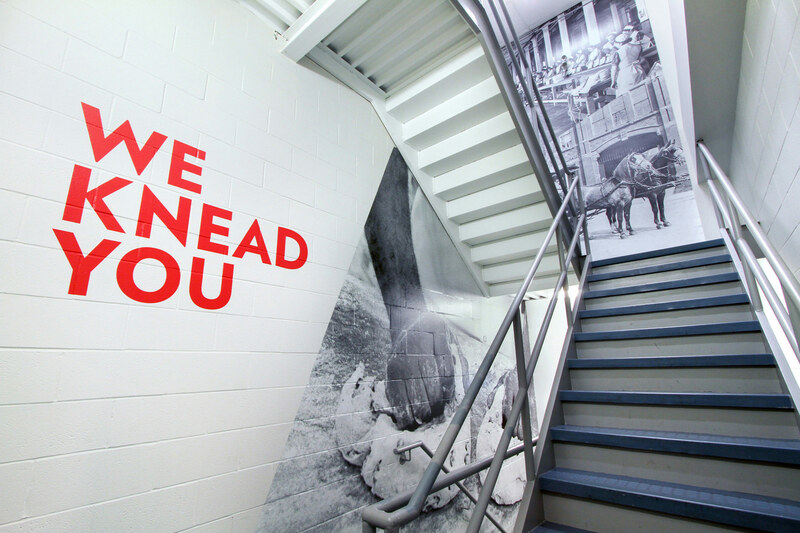 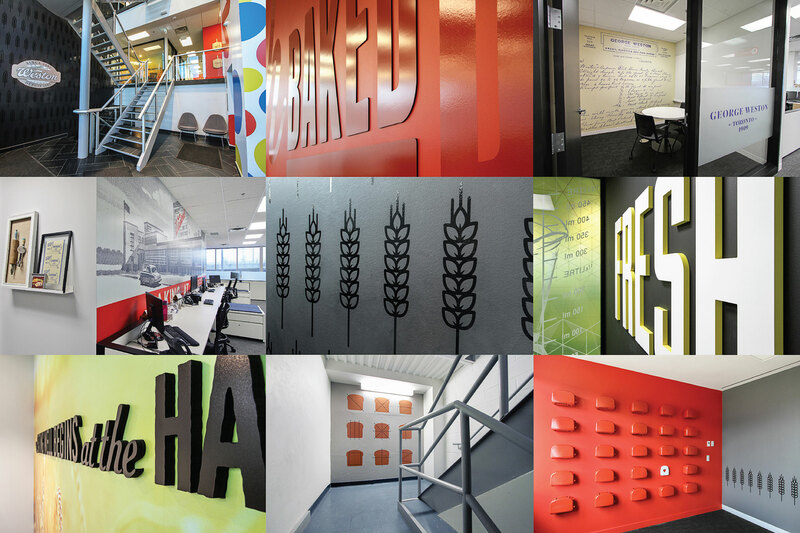 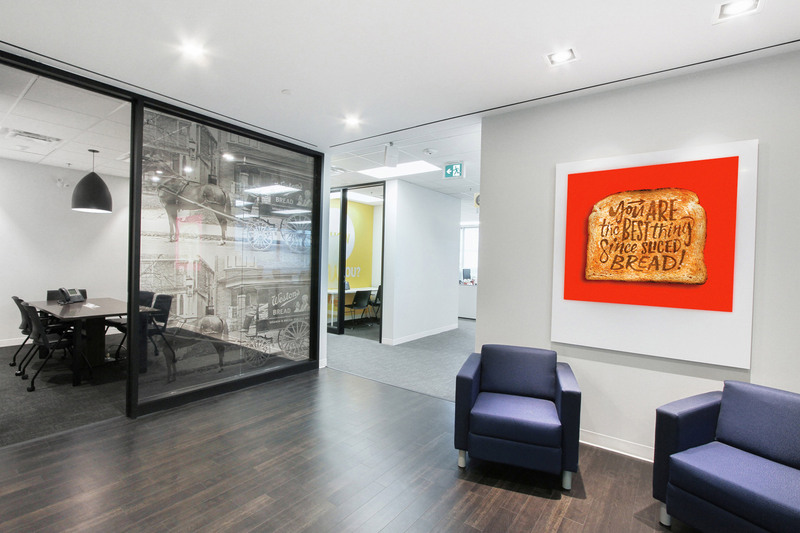 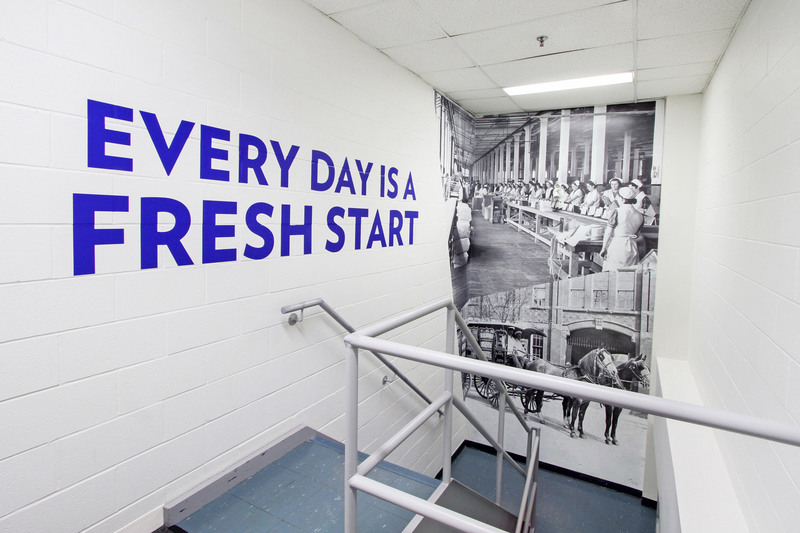 We integrated installation pieces, light boxes, full-wall wraps, 3-D type, custom illustrations, gallery walls, neon signage, and lots of colour in order to revitalize the space and map out new experiences within it. 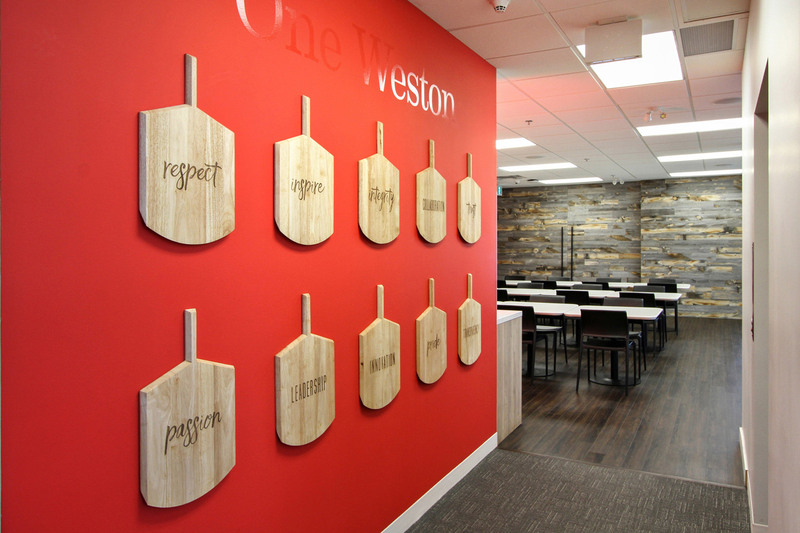 We even let the workers be part of the art through interactive boardroom installations that reflected the individuals who make up Weston Bakeries. 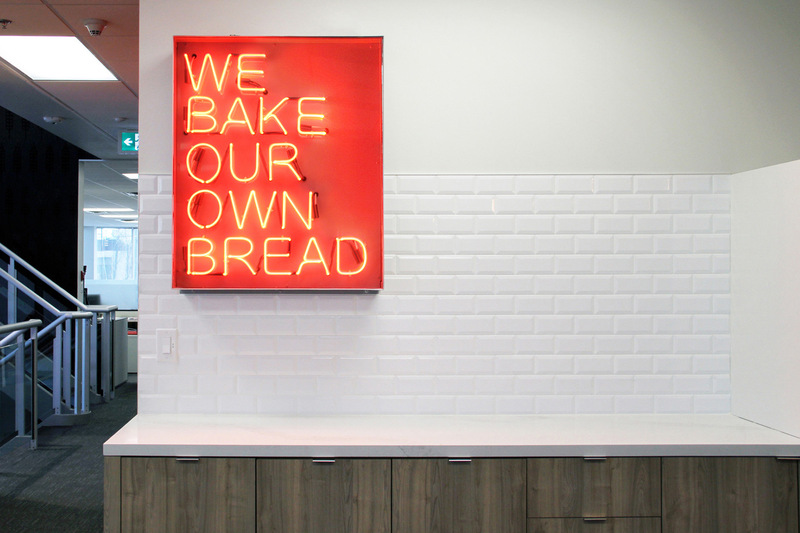 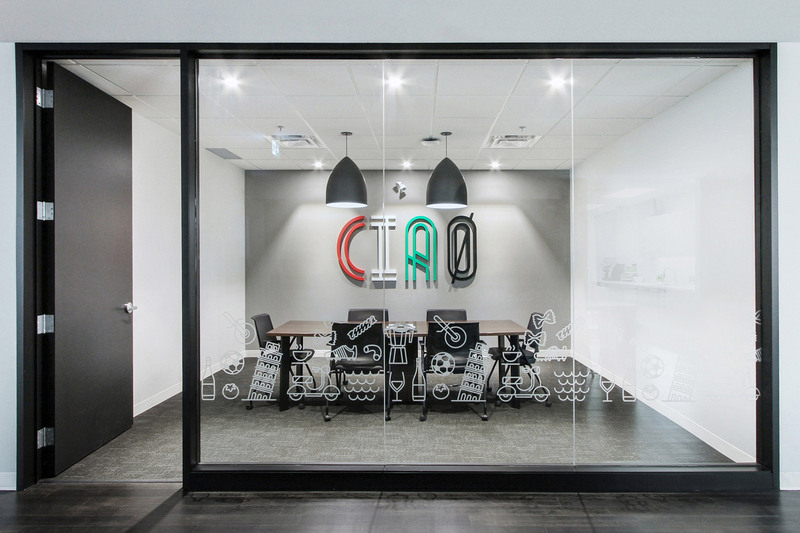 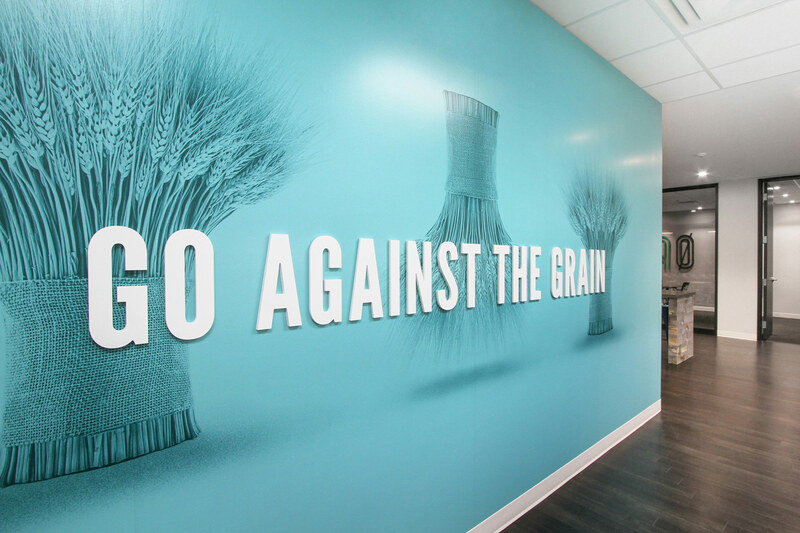 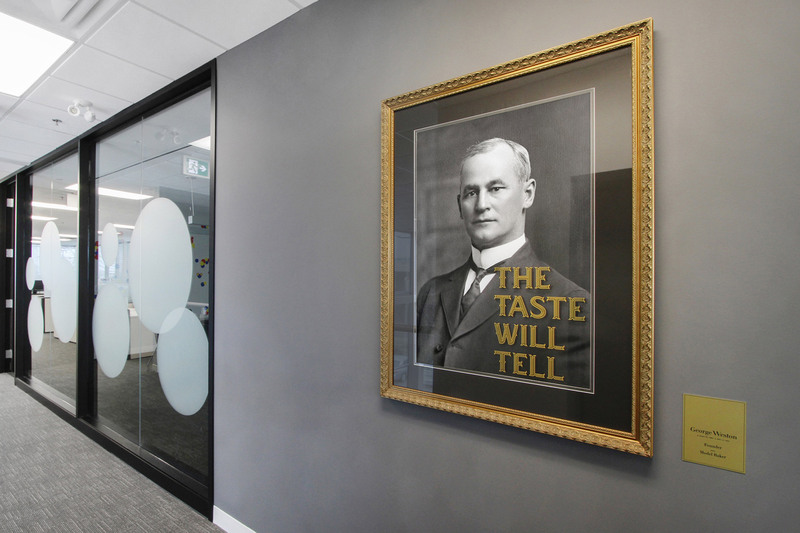 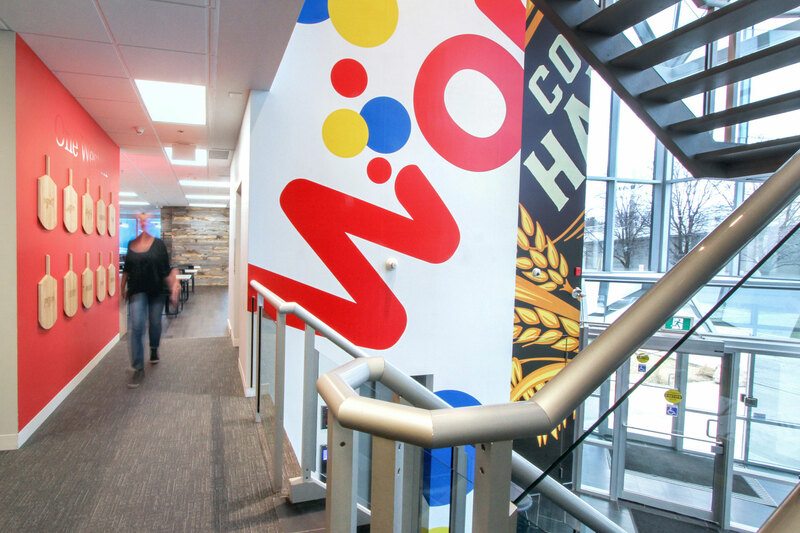 It was an incredible transformation—and the office is now an invigorating and inspiring space for staff, as well as a place they are proud to bring in customers for meetings, workshops and product launches. 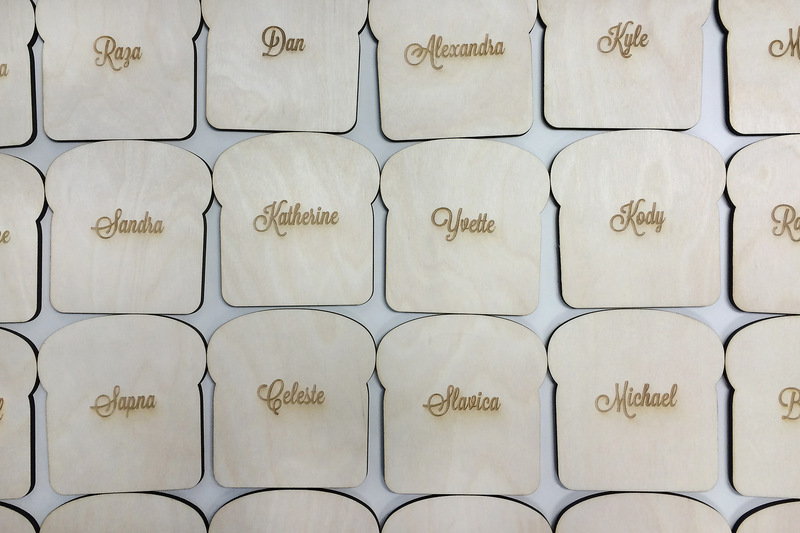 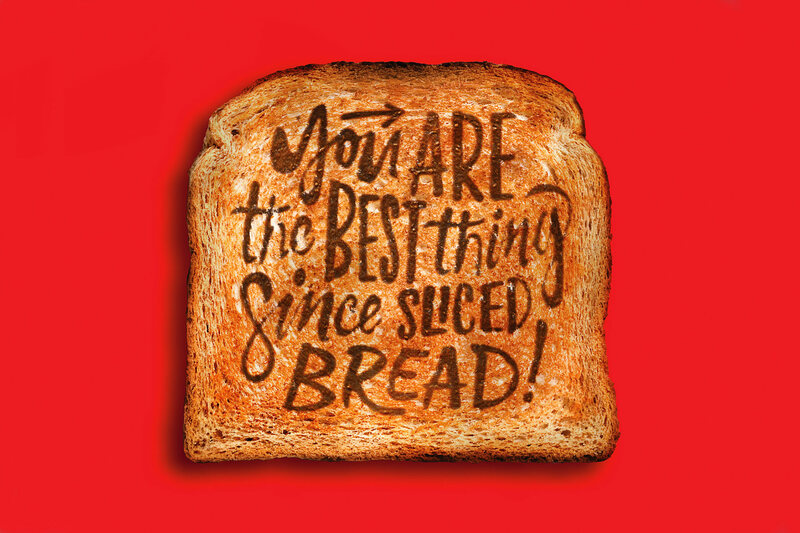 We think that’s toast-worthy.